Embezzlement is a crime that takes place when a person purposely withholds or uses assets and monies for a purpose other than for what it is intended. Also referred to as “financial fraud” or “larceny,” embezzlement is typically committed by an employee who is in charge of an agency or company’s finances, or a person who has responsibilities pertaining to the assets. Embezzlement is considered a white-collar crime, and can affect both small and large businesses. 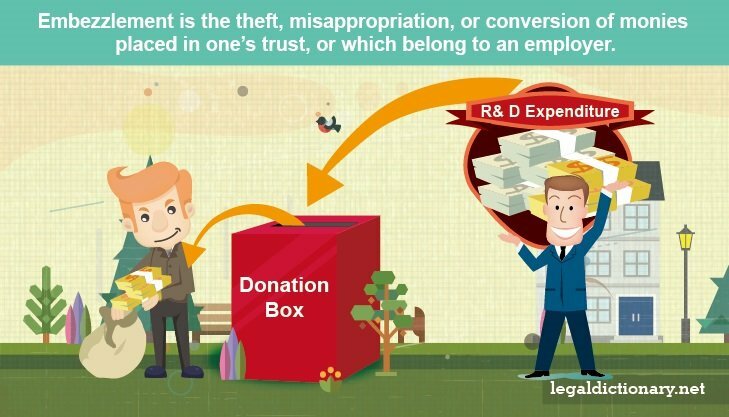 To explore this concept, consider the following embezzlement definition. The theft, misappropriation, or conversion of monies placed in one’s trust, or which belong to an employer. Embezzlement takes place when a perpetrator takes or uses a company’s or agency’s money without consent. The perpetrator may take small amounts over a period of time to prevent administrators from noticing, or they may take a large sum at once and use various methods to cover up the crime. This sometimes includes moving funds around from one account to another, or producing fake receipts to ensure the missing money goes unnoticed. In some instances, embezzlement can take place over several years before the owner or financial department realizes what has been happening. Most commonly, the crime of embezzlement takes place on the state level and each state has specific statues and penal codes pertaining to the crime. Embezzlement is considered a premeditated and/or methodical crime. In the United States, there are certain elements that must be in place in order for a prosecutor to charge a person with the crime of embezzlement. This is true for other crimes, though the exact elements required for embezzlement charges vary. The defendant must understand that he/or she committed a crime by taking the money or property. If the person is not aware that the act was wrong, it can result in a different charge. Larceny for instance, is the act of stealing from another person, which differs from embezzlement. The person accused of embezzlement must not believe that the money or property rightfully belongs to them. The crime of embezzlement consists of wrongfully depriving a person of his or her property. For instance, if a person takes from the petty cash, truly believing that is it there for company meals, this does not constitute embezzlement since they believe this is what the cash is to be used for. Another element of the crime is intent. For a person to be found guilty of embezzlement, they must have purposely taken the money or property in order to defraud the business owner. If they have taken the assets with the intent to return them, it is not considered embezzlement, but may be considered fraud or larceny. The defendant being charged must have been entrusted with the money or property. For instance, the theft of cash from a register at a grocery store by one of the clerks constitutes larceny rather than embezzlement, as the clerk has not been entrusted with the company’s finances. If the accountant of the grocery store chain takes money out of the petty cash fund for personal use, however, it is considered embezzlement, as the accountant was in charge of the company’s finances. The amount of money or value of property taken determines whether the perpetrator is charged with felony embezzlement or a misdemeanor. Each state has exact determining limits in place, but most states consider anything over $2,500 to be felony embezzlement. Felony embezzlement charges often result in stiffer sentences. Several things are taken into consideration during the punishment phase of embezzlement cases. The exact sentencing in embezzlement punishment depends on the amount of money or property misused, and the defendant’s prior record. When the person is convicted of embezzlement, penalties usually include an order to make restitution, which involves paying the victim back the entire amount, plus interest if required. If the sum is large, the judge may allow the defendant to make payments until the debt is resolved. It is common for the defendant to be placed on probation until the entire amount is repaid. Judges may also impose a harsher embezzlement punishment, including jail or prison time, community service, and court fees. The amount of jail or prison time ordered for embezzlement cases varies, but can range from 1 to 150 years depending on the severity of the case. Before reporting embezzlement, employers should first become familiar with what exactly embezzlement involves. They should also be absolutely certain that the employee has committed the crime. If an employer suspects that a person is embezzling, or stealing from the company in another way, it is important to investigate the situation before making accusations. Making false accusations of, or falsely reporting embezzlement could not only result in embarrassment, but the stigma of having been accused could have negative effects on that employee’s future career. Often times, there are warning signs an employer can look for when they suspect a person is embezzling from the company. This requires a check to ensure the employee is not having any mail, specifically bills or invoices, rerouted to a personal residence or private mail box. Other warning signs of embezzlement include the receipt of delinquent taxes notifications, or cash reserves slowly depleting. If an employer becomes aware that an employee is embezzling, they should contact a lawyer as soon as possible. Employers should not question employees or take other actions until a lawyer gives the go ahead to avoid stepping outside legal boundaries. A lawyer can oversee the investigation and help the employer through the process while ensuring all actions are within the legal limits. Employers should not discuss the investigation while it is taking place. All information must be kept confidential until the court proceedings end. If the investigation finds that embezzlement has taken place, a police report should be filed. Over the years, the court systems throughout the United States have seen numerous embezzlement cases. Some however, have gained notoriety due to the individuals involved, or the amount of assets embezzled. Darryl McCauley was business manager to comedian Dane Cook from 2004 to 2008. During this four-year period, McCauley and his wife stole money from Cook’s personal and business accounts and used the funds to travel, purchase a home, and invest in stocks. When Cook hired person manager to take over the business manager position in 2008, it came to light that McCauley had embezzled over 12 million dollars. McCauley was charged in 2010, and the case went to court. McCauley was convicted and sentenced to five years in prison, and ordered to pay Cook back in full. Bernie Madoff, founder of Wall Street firm Bernard L. Madoff Investment Securities LLC, constructed a fraudulent investment scheme now known as the “Ponzi Scheme.” This ploy allowed Madoff to borrow from his investors and pay it back with capital earned from other investors. He then in turn, planned to pay these other investors back with money gained from potential investors. The scheme failed and, though he attempted to pay back some of the investors, they were never paid in full. In December 2008, the FBI arrested Madoff, charging him with securities fraud. In March 2009, Madoff plead guilty to embezzlement of more than 50 billion dollars through his Ponzi scheme. Sentenced to 150 years in prison, and to pay back every one of his investors, Madoff will spend the rest of his life in prison. Christa Utt, a Girl Scout troop leader in Edmond Oklahoma, began stealing money that the scouts had collected from their annual cookie sales. Utt also stole a donation made by the family member of a deceased troop leader. Authorities became aware of the thefts in 2011 when funds were not available for the Girl Scouts to participate in their usual scouting activities. Utt was convicted of embezzling more than $5,000. Financial Fraud – Acting deceptively in order to gain money or assets. This is also known as embezzlement, but is can be considered larceny in some cases. Penal Code – A code of laws including their definitions and punishments. Perpetrator – A person who commits a crime or takes part in an evil act. Restitution – Returning lost or stolen money or items to the rightful owner. This can also include paying the county or state for the expenses a criminal incurred while in jail or prison. White Collar Crime – Crimes that are non-violent in nature and involve financial gain. White collar crimes generally take place within businesses, or at the governmental level. I am head of a not-for-profit group and I have been shown evidence that the former treasurer committed embezzlement. How should I proceed? No one knows this except myself and the new treasurer at this time. I think the previous treasurer may suspect we know because she refuses to return calls. The amount may be around $6000. My sister was in charged of my parents financies until my Brother and our Father found out money was missing and all that was left in their account was 350 dollars. My Brother then took over the financies and found out that there was around 90 thousand dollars missing, plus found out my Mother’s life insurance policy was no longer there to pay for her funeral. Is there anything we can do sence our mother has passed away in 2010? We are from wisconsin and in need of answers. Can the owner of a small business, which is incorporated, has stocks(which he is the only stock holder), be found guilty of embezzlement? Property Owners Assoc employee knowingly used the corporate credit card to pay personal expenses of $2500 and two board members have covered it up and threatened the other employees’ jobs should they leak the information.